for Excellence in Tourism in the Tourist Guide category. 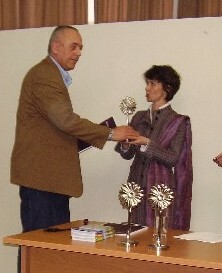 The award is given by National Tourism Organization of Serbia (NTOS), after a process of selection between competing candidates which includes video recording of the guide's on-site presentation and rigorous evaluation of his/her verbal and nonverbal communication skills (The Art of Guiding), as well as of his/her overall professional achievement. The decision is made by a committee made up of prominent and experienced tourism professionals specially appointed by NTOS. on 20th of April, 2006.